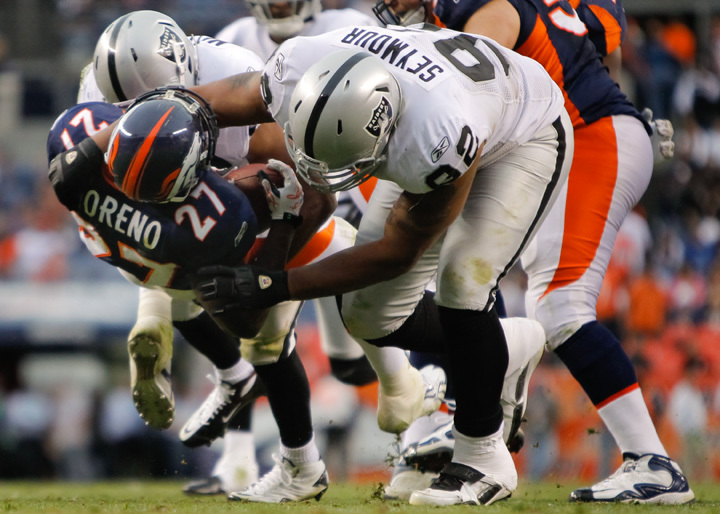 The Oakland Raiders open up the 2011 NFL regular season against longtime hated division rival the Denver Broncos on Monday Night Football. The preseason was a disappointment for the Raiders, finishing 0-4 and leaving first-year head coach Hue Jackson looking for his first win. Expectations are high in this Week 1 division duel, especially after Oakland smashed Denver last season in the Mile High, 59-14—the most points scored in franchise history.Oakland of course swept Denver with a 39-23 win at home when Tim Tebow finally made the highlight reel. The Raiders used a heavy dose of their ground game in both meetings, rushing for a grand total of 328 yards on October 24th and 264 yards on December 19th. Ground Game Key For Oakland: Jackson is still behind the wheel of the offense and the objective will be to ram it down the Broncos throats like they did last year. Darren McFadden, Michael Bush and rookie Taiwan Jones will look to take advantage of a Denver defense that allowed 154.6 yards per game in 2010. McFadden chalked up a career-high1,157 yards last year and 165 yards on the ground and four total touchdowns alone in the first get-together with Denver and followed it was 119 rushing yards in the second division duel. 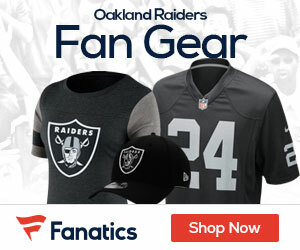 Raiders Offense Needs To Maintain Balance: Entering his second season in Oakland, quarterback Jason Campbell is ready to provide a quick spark to the offense. The ex-Redskin has great expectations for the team in order to provide a solid aerial attack that will match the running game to keep the opposition in flux. Campbell may not have as many high-caliber weapons as Aaron Rodgers, Drew Brees or Tom Brady, but he has a solid supporting cast with young talented receivers like up-and-coming star Louis Murphy (who will miss the Monday night game due to injury), Chaz Schilens, Jacoby Ford, Darrius Heyward-Bey, rookie Denarius Moore and veteran Derek Hagan. The offensive line might still be in rebuilding phase but possesses a solid unit that provides not only amazing ability in run blocking, but also solid pass protection. The Broncos come into the matchup with fast pass-rushers that can confuse any quarterback. Jason Campbell is going to need to have a considerable amount of time in the pocket to make his reads and locate the open receiver down the field. Denver’s D: The Broncos’ defense finished dead last in the league in 2010 in total defense and sacks and next-to-last against the run. However, Elvis Dumervil returns to the field and has help with the new additions in Brodrick Bunkley, Ty Warren, a draft bust in Jacksonville in Derrick Harvey and first-round-pick Von Miller. I’m not sold on a smooth switch with Vonny playing as a 4-3 OLB, but he’s easily as explosive as TNT. Miller accrued three sacks in preseason and shows signs of great things to come. Oakland’s Objective: The main focus for Oakland is to slow down Kyle Orton and Denver’s offense which still possesses a ton of horsepower and faces a “Nnadmi-less” secondary. In order to accomplish this, Richard Seymour and the D-Line will need to apply consistent pressure on Orton and Rolando McClain needs to take command of the front seven and bend, but don’t break against Denver in the run game, which is powered Knowshon Moreno and newly-acquired veteran Willis McGahee. Veteran cornerback Chris Johnson returns from an injury and will be placed back into his starting spot opposite Stanford Routt. Safety Marvin Mitchell and tight end Kevin Boss should be in the line-up as well. The Raiders secondary, and defense as a whole needs to avoid being burned by all costs and stay on Orton’s top target Brandon Lloyd like white on rice. Lloyd achieved 77 receptions, 1448 yards and 11 touchdowns last season. Marquee Monster Monday Madness Matchup: Say that five times fast! These two hated division foes look to have an arduous apocalyptic high-stakes battle for four full quarters. The Raiders have won the past three meetings, but Oakland has lost its last 11 primetime games. Denver’s favored, but I believe the Raiders will continue to stay on track and pull out an impressive win in comfortable fashion, 27-10.